This article is about the geographical reference system. For other uses, see Latitude (disambiguation). 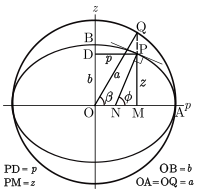 A graticule on the Earth as a sphere or an ellipsoid. The lines from pole to pole are lines of constant longitude, or meridians. The circles parallel to the equator are lines of constant latitude, or parallels. The graticule shows the latitude and longitude of points on the surface. In this example meridians are spaced at 6° intervals and parallels at 4° intervals. Since there are many different reference ellipsoids, the precise latitude of a feature on the surface is not unique: this is stressed in the ISO standard which states that "without the full specification of the coordinate reference system, coordinates (that is latitude and longitude) are ambiguous at best and meaningless at worst". This is of great importance in accurate applications, such as a Global Positioning System (GPS), but in common usage, where high accuracy is not required, the reference ellipsoid is not usually stated. In English texts the latitude angle, defined below, is usually denoted by the Greek lower-case letter phi (φ or ϕ). It is measured in degrees, minutes and seconds or decimal degrees, north or south of the equator. The precise measurement of latitude requires an understanding of the gravitational field of the Earth, either to set up theodolites or to determine GPS satellite orbits. The study of the figure of the Earth together with its gravitational field is the science of geodesy. This article relates to coordinate systems for the Earth: it may be extended to cover the Moon, planets and other celestial objects by a simple change of nomenclature.
) are defined on a spherical model. The graticule spacing is 10 degrees. The graticule is formed by the lines of constant latitude and constant longitude, which are constructed with reference to the rotation axis of the Earth. The primary reference points are the poles where the axis of rotation of the Earth intersects the reference surface. Planes which contain the rotation axis intersect the surface at the meridians; and the angle between any one meridian plane and that through Greenwich (the Prime Meridian) defines the longitude: meridians are lines of constant longitude. The plane through the centre of the Earth and perpendicular to the rotation axis intersects the surface at a great circle called the Equator. Planes parallel to the equatorial plane intersect the surface in circles of constant latitude; these are the parallels. The Equator has a latitude of 0°, the North Pole has a latitude of 90° North (written 90° N or +90°), and the South Pole has a latitude of 90° South (written 90° S or −90°). The latitude of an arbitrary point is the angle between the equatorial plane and the normal to the surface at that point: the normal to the surface of the sphere is along the radius vector. The latitude, as defined in this way for the sphere, is often termed the spherical latitude, to avoid ambiguity with the geodetic latitude and the auxiliary latitudes defined in subsequent sections of this article. The orientation of the Earth at the December solstice. The figure shows the geometry of a cross-section of the plane perpendicular to the ecliptic and through the centres of the Earth and the Sun at the December solstice when the Sun is overhead at some point of the Tropic of Capricorn. The south polar latitudes below the Antarctic Circle are in daylight, whilst the north polar latitudes above the Arctic Circle are in night. The situation is reversed at the June solstice, when the Sun is overhead at the Tropic of Cancer. Only at latitudes in between the two tropics is it possible for the Sun to be directly overhead (at the zenith). On map projections there is no universal rule as to how meridians and parallels should appear. 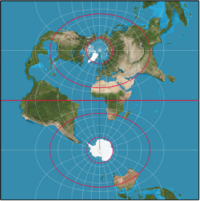 The examples below show the named parallels (as red lines) on the commonly used Mercator projection and the Transverse Mercator projection. On the former the parallels are horizontal and the meridians are vertical, whereas on the latter there is no exact relationship of parallels and meridians with horizontal and vertical: both are complicated curves. where R denotes the mean radius of the Earth. R is equal to 6,371 km or 3,959 miles. No higher accuracy is appropriate for R since higher-precision results necessitate an ellipsoid model. With this value for R the meridian length of 1 degree of latitude on the sphere is 111.2 km (69.1 statute miles) (60.0 nautical miles). The length of 1 minute of latitude is 1.853 km (1.151 statute miles) (1.00 nautical miles), while the length of 1 second of latitude is 30.8 m or 101 feet (see nautical mile). Many different reference ellipsoids have been used in the history of geodesy. In pre-satellite days they were devised to give a good fit to the geoid over the limited area of a survey but, with the advent of GPS, it has become natural to use reference ellipsoids (such as WGS84) with centre at the centre of mass of the Earth and minor axis aligned to the rotation axis of the Earth. These geocentric ellipsoids are usually within 100 m (330 ft) of the geoid. Since latitude is defined with respect to an ellipsoid, the position of a given point is different on each ellipsoid: one cannot exactly specify the latitude and longitude of a geographical feature without specifying the ellipsoid used. Many maps maintained by national agencies are based on older ellipsoids, so one must know how the latitude and longitude values are transformed from one ellipsoid to another. GPS handsets include software to carry out datum transformations which link WGS84 to the local reference ellipsoid with its associated grid. 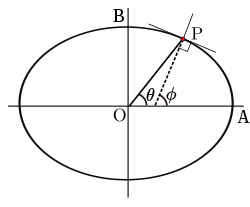 A sphere of radius a compressed to an oblate ellipsoid of revolution. The difference between the semi-major and semi-minor axes is about 21 km (13 miles) and as fraction of the semi-major axis it equals the flattening; on a computer monitor the ellipsoid could be sized as 300 by 299 pixels. This would barely be distinguishable from a 300-by-300-pixel sphere, so illustrations usually exaggerate the flattening. 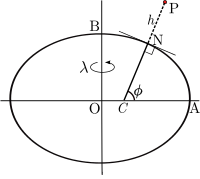 The definition of geodetic latitude (φ) and longitude (λ) on an ellipsoid. The normal to the surface does not pass through the centre, except at the equator and at the poles. 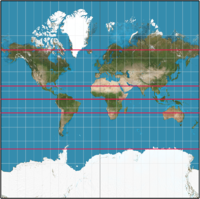 Geodetic latitude: the angle between the normal and the equatorial plane. The standard notation in English publications is φ. This is the definition assumed when the word latitude is used without qualification. The definition must be accompanied with a specification of the ellipsoid. Geocentric latitude: the angle between the radius (from centre to the point on the surface) and the equatorial plane. (Figure below). There is no standard notation: examples from various texts include θ, ψ, q, φ′, φc, φg. This article uses θ.
Spherical latitude: the angle between the normal to a spherical reference surface and the equatorial plane. Geographic latitude must be used with care. Some authors use it as a synonym for geodetic latitude whilst others use it as an alternative to the astronomical latitude. Latitude (unqualified) should normally refer to the geodetic latitude. The importance of specifying the reference datum may be illustrated by a simple example. On the reference ellipsoid for WGS84, the centre of the Eiffel Tower has a geodetic latitude of 48° 51′ 29″ N, or 48.8583° N and longitude of 2° 17′ 40″ E or 2.2944°E. The same coordinates on the datum ED50 define a point on the ground which is 140 metres (460 feet) distant from the tower. A web search may produce several different values for the latitude of the tower; the reference ellipsoid is rarely specified. 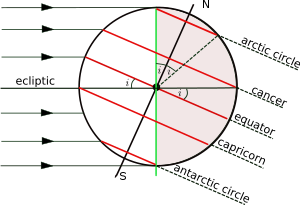 where M(φ) is the meridional radius of curvature. For WGS84 this distance is 7007100019657290000♠10001.965729 km. A calculator for any latitude is provided by the U.S. Government's National Geospatial-Intelligence Agency (NGA). The following graph illustrates the variation of both a degree of latitude and a degree of longitude with latitude. 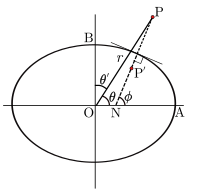 The definition of geodetic latitude (φ) and geocentric latitude (θ). Historically a nautical mile was defined as the length of one minute of arc along a meridian of a spherical earth. An ellipsoid model leads to a variation of the nautical mile with latitude. This was resolved by defining the nautical mile to be exactly 1,852 metres. However for all practical purposes distances are measured from the latitude scale of charts. As the Royal Yachting Association says in its manual for day skippers: "1 (minute) of Latitude = 1 sea mile", followed by "For most practical purposes distance is measured from the latitude scale, assuming that one minute of latitude equals one nautical mile". The definitions given in this section all relate to locations on the reference ellipsoid but the first two auxiliary latitudes, like the geodetic latitude, can be extended to define a three-dimensional geographic coordinate system as discussed below. The remaining latitudes are not used in this way; they are used only as intermediate constructs in map projections of the reference ellipsoid to the plane or in calculations of geodesics on the ellipsoid. Their numerical values are not of interest. For example, no one would need to calculate the authalic latitude of the Eiffel Tower. The expressions below give the auxiliary latitudes in terms of the geodetic latitude, the semi-major axis, a, and the eccentricity, e. (For inverses see below.) The forms given are, apart from notational variants, those in the standard reference for map projections, namely "Map projections: a working manual" by J. P. Snyder. Derivations of these expressions may be found in Adams and online publications by Osborne and Rapp. 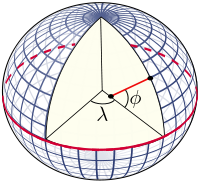 Definition of the parametric latitude (β) on the ellipsoid. Cayley suggested the term parametric latitude because of the form of these equations. 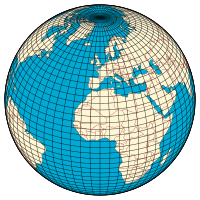 The parametric latitude is not used in the theory of map projections. Its most important application is in the theory of ellipsoid geodesics, (Vincenty, Karney). defines a projection from the ellipsoid to the sphere such that all meridians have true length and uniform scale. The sphere may then be projected to the plane with an equirectangular projection to give a double projection from the ellipsoid to the plane such that all meridians have true length and uniform meridian scale. An example of the use of the rectifying latitude is the Equidistant conic projection. (Snyder, Section 16). The rectifying latitude is also of great importance in the construction of the Transverse Mercator projection. The authalic (Greek for same area) latitude, ξ, gives an area-preserving transformation to a sphere. The conformal latitude, χ, gives an angle-preserving (conformal) transformation to the sphere. The conformal latitude defines a transformation from the ellipsoid to a sphere of arbitrary radius such that the angle of intersection between any two lines on the ellipsoid is the same as the corresponding angle on the sphere (so that the shape of small elements is well preserved). A further conformal transformation from the sphere to the plane gives a conformal double projection from the ellipsoid to the plane. This is not the only way of generating such a conformal projection. For example, the 'exact' version of the Transverse Mercator projection on the ellipsoid is not a double projection. (It does, however, involve a generalisation of the conformal latitude to the complex plane). The formulae in the previous sections give the auxiliary latitude in terms of the geodetic latitude. The expressions for the geocentric and parametric latitudes may be inverted directly but this is impossible in the four remaining cases: the rectifying, authalic, conformal, and isometric latitudes. There are two methods of proceeding. The first is a numerical inversion of the defining equation for each and every particular value of the auxiliary latitude. The methods available are fixed-point iteration and Newton–Raphson root finding. The other, more useful, approach is to express the auxiliary latitude as a series in terms of the geodetic latitude and then invert the series by the method of Lagrange reversion. Such series are presented by Adams who uses Taylor series expansions and gives coefficients in terms of the eccentricity. Osborne derives series to arbitrary order by using the computer algebra package Maxima and expresses the coefficients in terms of both eccentricity and flattening. The series method is not applicable to the isometric latitude and one must use the conformal latitude in an intermediate step. To first order in the flattening f, the auxiliary latitudes can be expressed as ζ = φ − Cf sin 2φ where the constant C takes on the values [​1⁄2, ​2⁄3, ​3⁄4, 1, 1] for ζ = [β, ξ, μ, χ, θ]. The geodetic latitude, or any of the auxiliary latitudes defined on the reference ellipsoid, constitutes with longitude a two-dimensional coordinate system on that ellipsoid. To define the position of an arbitrary point it is necessary to extend such a coordinate system into three dimensions. Three latitudes are used in this way: the geodetic, geocentric and parametric latitudes are used in geodetic coordinates, spherical polar coordinates and ellipsoidal coordinates respectively. At an arbitrary point P consider the line PN which is normal to the reference ellipsoid. The geodetic coordinates P(ɸ,λ,h) are the latitude and longitude of the point N on the ellipsoid and the distance PN. This height differs from the height above the geoid or a reference height such as that above mean sea level at a specified location. The direction of PN will also differ from the direction of a vertical plumb line. The relation of these different heights requires knowledge of the shape of the geoid and also the gravity field of the Earth. 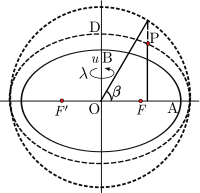 The geocentric latitude θ is the complement of the polar angle θ′ in conventional spherical polar coordinates in which the coordinates of a point are P(r,θ′,λ) where r is the distance of P from the centre O, θ′ is the angle between the radius vector and the polar axis and λ is longitude. Since the normal at a general point on the ellipsoid does not pass through the centre it is clear that points P' on the normal, which all have the same geodetic latitude, will have differing geocentric latitudes. Spherical polar coordinate systems are used in the analysis of the gravity field. The parametric latitude can also be extended to a three-dimensional coordinate system. For a point P not on the reference ellipsoid (semi-axes OA and OB) construct an auxiliary ellipsoid which is confocal (same foci F, F′) with the reference ellipsoid: the necessary condition is that the product ae of semi-major axis and eccentricity is the same for both ellipsoids. Let u be the semi-minor axis (OD) of the auxiliary ellipsoid. Further let β be the parametric latitude of P on the auxiliary ellipsoid. The set (u,β,λ) define the ellipsoid coordinates. :§4.2.2 These coordinates are the natural choice in models of the gravity field for a rotating ellipsoidal body. The relations between the above coordinate systems, and also Cartesian coordinates are not presented here. The transformation between geodetic and Cartesian coordinates may be found in Geographic coordinate conversion. The relation of Cartesian and spherical polars is given in Spherical coordinate system. The relation of Cartesian and ellipsoidal coordinates is discussed in Torge. 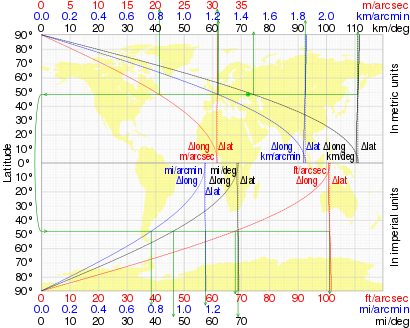 Astronomical latitude (Φ) is the angle between the equatorial plane and the true vertical at a point on the surface. The true vertical, the direction of a plumb line, is also the direction of the gravity acceleration, the resultant of the gravitational acceleration (mass-based) and the centrifugal acceleration at that latitude. Astronomic latitude is calculated from angles measured between the zenith and stars whose declination is accurately known. In general the true vertical at a point on the surface does not exactly coincide with either the normal to the reference ellipsoid or the normal to the geoid. The angle between the astronomic and geodetic normals is usually a few seconds of arc but it is important in geodesy. The reason why it differs from the normal to the geoid is, because the geoid is an idealized, theoretical shape "at mean sea level". Points on the real surface of the earth are usually above or below this idealized geoid surface and here the true vertical can vary slightly. Also, the true vertical at a point at a specific time is influenced by tidal forces, which the theoretical geoid averages out. Astronomical latitude is not to be confused with declination, the coordinate astronomers use in a similar way to specify the angular position of stars north/south of the celestial equator (see equatorial coordinates), nor with ecliptic latitude, the coordinate that astronomers use to specify the angular position of stars north/south of the ecliptic (see ecliptic coordinates). ^ The value of this angle today is 23°26′12.4″ (or 23.43678°). This figure is provided by Template:Circle of latitude. ^ An elementary calculation involves differentiation to find the maximum difference of the geodetic and geocentric latitudes. ^ Newton, Isaac. "Book III Proposition XIX Problem III". Philosophiæ Naturalis Principia Mathematica. Translated by Motte, Andrew. p. 407. ^ a b c d e Torge, W. (2001). Geodesy (3rd ed.). De Gruyter. ISBN 3-11-017072-8. ^ a b c d e Osborne, Peter (2013). "Chapters 5,6". The Mercator Projections. doi:10.5281/zenodo.35392. for LaTeX code and figures. ^ a b c d Rapp, Richard H. (1991). "Chapter 3". Geometric Geodesy, Part I. Columbus, OH: Dept. of Geodetic Science and Surveying, Ohio State Univ. ^ "Length of degree calculator". National Geospatial-Intelligence Agency. ^ a b c d e Snyder, John P. (1987). Map Projections: A Working Manual. U.S. Geological Survey Professional Paper 1395. Washington, DC: United States Government Printing Office. ^ Legendre, A. M. (1806). "Analyse des triangles tracés sur la surface d'un sphéroïde". Mém. Inst. Nat. Fr. 1st semester: 130–161. ^ Bessel, F. W. (1825). "Über die Berechnung der geographischen Langen und Breiten aus geodatischen Vermessungen". Astron. Nachr. 4 (86): 241–254. arXiv:0908.1824. Bibcode:2010AN....331..852K. doi:10.1002/asna.201011352. Translation: Karney, C. F. F.; Deakin, R. E. (2010). "The calculation of longitude and latitude from geodesic measurements". Astron. Nachr. 331 (8): 852–861. arXiv:0908.1824. Bibcode:1825AN......4..241B. doi:10.1002/asna.18260041601. ^ Cayley, A. (1870). "On the geodesic lines on an oblate spheroid". Phil. Mag. 40 (4th ser. ): 329–340. ^ Karney, C. F. F. (2013). "Algorithms for geodesics". J. Geodesy. 87 (1): 43–55. arXiv:1109.4448. Bibcode:2013JGeod..87...43K. doi:10.1007/s00190-012-0578-z. ^ "Maxima computer algebra system". Sourceforge. ^ Hofmann-Wellenhof, B.; Moritz, H. (2006). Physical Geodesy (2nd ed.). ISBN 3-211-33544-7.